Vitamin E - Are You Ready for a Change? Here are fifteen foods with vitamin E to strongly consider adding to your diet. Most plant seed oils are very good sources for Vitamin E as well. The best oil with vitamin E is Wheat germ oil. In fact, one tablespoon of this oil holds 100% of your daily Vitamin E requirements. Sunflower oil is another excellent option, as it provides over 5 mg of the vitamin, and can easily be be used for cooking. Other great Vitamin-E-rich oils include hempseed oil, coconut oil, cottonseed oil (with almost 5 mg of vitamin E), olive oil and safflower oil. Oils that are cold pressed, unrefined and organic are recommended. Canola oil is known to severely deplete Vitamin E levels in the body, as well as cause severe clotting of red blood cells, which can pose a serious health risk. A perfect snack during a long workday, eating just one ounce of hazelnuts can provide you with approximately 20% of our daily requirements of vitamin E.
These are just a few examples of foods with vitamin E. There are plenty more that aren’t listed here. Chlorella, squash, hemp, spirulina are also good sources of vitamin E.
The chemical name of vitamin E, tocopherol, is derived from toco, meaning "related to childbirth." 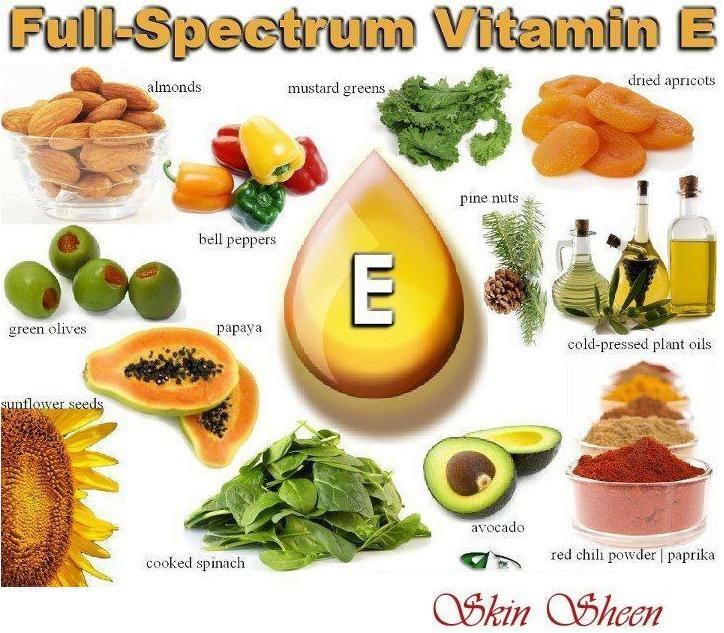 Vitamin E comprises a family of eight naturally occurring compounds: four tocopherols and four tocotrienols, of which alpha-tocopherol is the only one to have vitamin-E activity in the human body. It is also the most common form of vitamin E in food. Vitamin E is highly susceptible to destruction by oxygen, metals, light, and deep-fat frying. As a result, prolonged food storage lowers the vitamin-E content of food.